We've recently finished catching up on series 1 of Arrow. When it was first broadcast got about 3 episodes in but gave up, there were other things to watch and it didn't grab us at the time. I remember thinking that some of the dialogue felt a little clunky at the time. Also the island flashbacks looked interesting but we gave up Lost in early series 2, so were wary. I think the show benefits from being watched box-set style, not having to wait for reveals to be resolved and for the plot arcs to develop. I've been told that many different DC characters appear in more-grounded, less-superhero-y forms. I don't know much about that and only recognised a couple who had been in the Justice League cartoon I used to watch (that was good, I should check that out again sometime). Huntress was fairly obvious, also Deadshot and Deathstroke got to use their comic book names. Otherwise I didn't get the references, but that was OK.
Felicity Smoke is awesome and I love her! She knows all the things and is apparently the only person in the Q Consolidated IT department, which must be tricky for them when she goes to work in the basement of Oliver's club. It's cool that she seems fairly normal and stumbles over words or says the wrong thing. Also, despite getting sucked into the vigilante side of things, she's still a voice for regular morality, in which killing people is to be avoided. It's great that she sets the limits of how she's willing to help rather than jumping into team Hood. Oliver Queen is in the newspapers and on TV, he has a recognisable face. Yet he decided not to create a costume that adequately covers his face (unlike another illegal archer I could mention). Apparently a low hood, darkness, green face paint around your eyes and keeping your head lowered at all times (handy when you have to aim a bow) will protect your identity from even close friends, former lovers and family members. There are so many times when it seems like people should be able to identify him, yet inexplicably they do not. Literally it happens at least once an episode, and sometimes he's standing above people, so they can see right up his hood. Then occasionally someone will pull his hood all the way back (not difficult) and be all shocked at his identity. 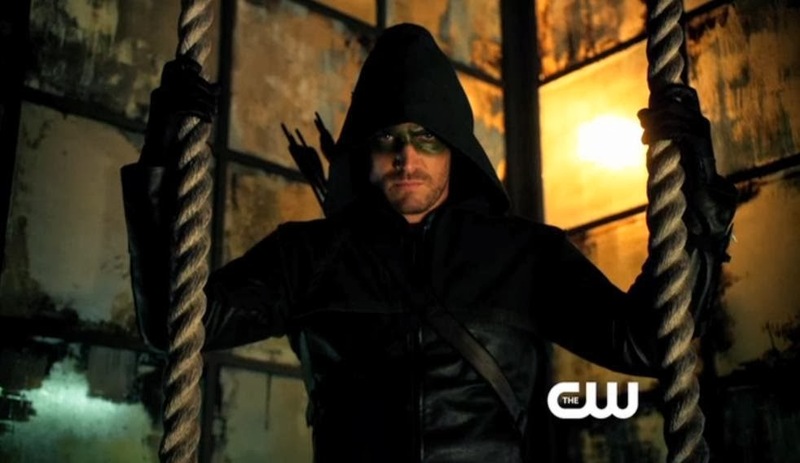 "Oh, the vigilante with the same chin and facial hair as Oliver Queen, is Oliver Queen!" It's just so silly! His forehead is covered and he's got paint round his eyes, could be anyone. John Barrowman is in this. His part is well-acted and interesting enough that we stopped shouting "Barrowman!" (a la David Tennant) after a few episodes. Also I think Torchwood hypnotised me enough that I didn't consider John Barrowman could be the father of a 20something, until I thought about it and realised that he could be really. Part of the premise is that Oliver Queen is a bit of a jerk. He used to be a huge jerk, but was changed by the island and still pretends to be a bit of a jerk, like Bruce Wayne does. The thing is that now he's just a jerk in a different way, mostly die to being all secretive and pushing away those he loves "for their protection" (most superheroes are that kind of jerk). So much that Oliver does, and the way he justifies it to himself and others, is flawed. However the show did have one moment where Oliver was positioned as a jerk, even though he wasn't. He goes on a date and she asks him about what actually happened on the island he was shipwrecked on for 5 years (supposedly alone). He's unwilling to talk about it, and how it changed him, but signed its hard to talk about. She gets annoyed and pushes, but then her phone rings. Now "saved by the cell" is a cool phrase that amused me slightly, but her behaviour didn't. Later the date is counted as a bad one and Oliver goes and apologises to her. "Sorry I didn't want to discuss a traumatic experience I had." If someone doesn't want to talk socially about a difficult life experience, you drop it. It kinda bothered me, because normally I don't approve of Oliver's behaviour, but in this case she was in the wrong even though the show wouldn't acknowledge that. Unfortunately I think that scene was based on some weird social/dating expectation wherein the man is automatically a jerk, or it's his job to apologise to the woman regardless of what actually happened. Oliver's sister Thea was kind of a brat, and she does a lot of stupid stuff, but she is rich and 17 and had family issues so I guess that's not surprising. Her relationship with wrong-side-of-the-tracks Roy initially made my eyes roll. She's rich, he snatches purses, they make out - just play uptown girl already, we get it. Somehow their relationship became not annoying by the end of the series and actually made a weird kind of sense, all the more effective because it surprised both characters as well. There are various other things I could mention. I was glad the island flashbacks were not like Lost and lots of stuff happened. It was interesting the Oliver's mum was involved in some dodgy, comicbook criminal plan. It's continually weird that he can shoot someone with an arrow faster than they can shoot him with a gun. Arrow's tone strikes for grounded and gritty, but given the premise/source material there's a lot of silliness in there too, which you just have to accept. Arrow isn't one of my favourites, but it entertains and I'm interested in seeing the next series.